ICCA-AIAC 2918 19th International Conference of Classical Archaeology: “Archaeology & Economy in the Ancient World”. Colonia-Bonn (Germany). – Pablo Ozcáriz Gil. Título de la comunicación “Los grafitos “ante cocturam” de las ánforas Dressel 20. Sisitematización para la elaboración de un corpus”. La comunicación formó parte del Panel 5.17 | Part 1, dedicado a ‘Transport amphorae’ moderada por R. D. Klug. La conferencia se celebró en la Universidad de Bonn, en la sala HS IX de 17:00-19:00h. – Juan Manuel Bermúdez. Título de la comunicación “A través de mar y montañas: la epigrafía anfórica en Noricum”. La comunicación formó parte del Panel 5.17 | Part 1, dedicado a ‘Transport amphorae’ moderada por R. D. Klug. La conferencia se celebró en la Universidad de Bonn, en la sala HS IX de 17:00-19:00h. – Daniel Martín-Arroyo. Título de la comunicación fue “Trade and institution from Alexandria to Rome: The amphorae from Pompeii”. La comunicación formó parte del Panel 5.17 | Part 1, dedicado a ‘Transport amphorae’ moderada por R. D. Klug. La conferencia se celebró en la Universidad de Bonn, en la sala HS IX de 17:00-19:00h. – Jordi Pérez González y Rocío Cuadra .Título de la comunicación “Mobiliario textil en la casa romana. La comodidad perdida”. La comunicación formó parte del Panel 5.17 | Part 1, dedicado a ‘Textiles and Fashion in Antiquity’ moderada por M. Harlow. La conferencia se celebró en la Universidad de Bonn, en la sala HS V de 11:30-13:30 h.
– Jordi Pérez González participó en el Panel 8.17 en la sala HS XII de 14:30-16:300h en la Universidad de Bonn con la comunicación “The Singularity of Rome. The sumptuary city.”. – Joan Rodríguez Segura. Título de la comunicación “From Gades to Aquileia: the maritime trade of foodstuffs from Spain to northern Italy during the High Empire”. La comunicación formó parte del Panel 5.17 | Part 1, dedicado a ‘New approaches to seaborne commerce in the Roman Empire’ moderada por Th. Schmidts y M. Seifert. La conferencia se celebró en la Universidad de Bonn, en la sala HS VI de 09:00-11:00h. – Mateo González-Vázquez. Título de la comunicación “The Iberian rural economy in the face of early Roman expansion (from the 3rd to the 1st centuries BCE)”. 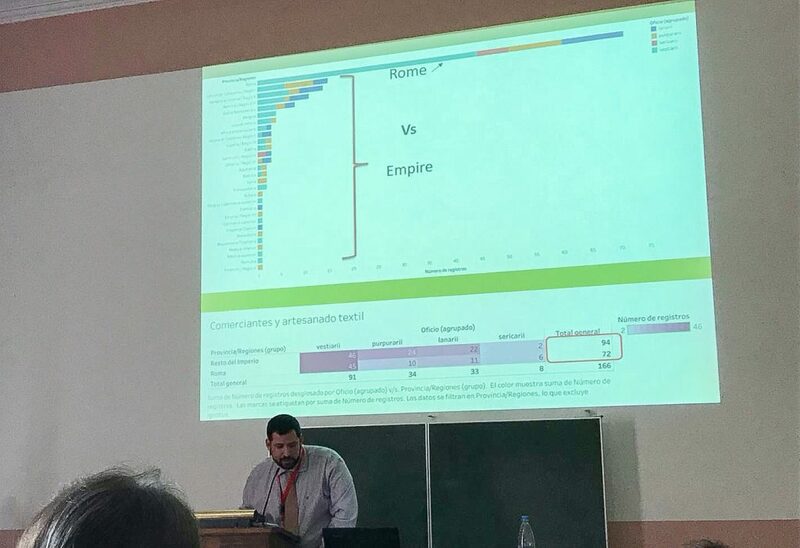 La comunicación formó parte del Panel 5.17 | Part 1, dedicado a ‘Targeting economic and cultural hotspots: an alternative view on early Roman expansionism’ moderada por T. Stek. La conferencia se celebró en la Universidad de Bonn, en la sala HS XIV de 14:30-16:30h. – Pablo Ozcáriz Gil. Title of the communication “The graffiti” before cocturam “of the Dressel amphoras 20. Sisitematización for the elaboration of a corpus”. The communication was part of Panel 5.17 | Part 1, dedicated to ‘Transport amphorae’ moderated by R. D. Klug. The conference was held at the University of Bonn, in the HS IX room from 5:00 p.m. to 7:00 p.m.
– Juan Manuel Bermúdez. Title of the communication “Through sea and mountains: the amphitic epigraphy in Noricum”. The communication was part of Panel 5.17 | Part 1, dedicated to ‘Transport amphorae’ moderated by R. D. Klug. The conference was held at the University of Bonn, in the HS IX room from 5:00 p.m. to 7:00 p.m.
– Daniel Martín-Arroyo. Title of the communication “Trade and institution from Alexandria to Rome: The amphorae from Pompeii”. The communication was part of Panel 5.17 | Part 1, dedicated to ‘Transport amphorae’ moderated by R. D. Klug. The conference was held at the University of Bonn, in the HS IX room from 5:00 p.m. to 7:00 p.m.
– Jordi Pérez González and Rocío Cuadra. Title of the communication “Textile furniture in the Roman house, lost comfort”. The communication was part of Panel 5.17 | Part 1, dedicated to ‘Textiles and Fashion in Antiquity’ moderated by M. Harlow. The conference was held at the University of Bonn, in the HS V room from 11: 30-13: 30 h.
– Joan Rodríguez Segura. Title of the communication “From Gades to Aquileia: the maritime trade of foodstuffs from Spain to northern Italy during the High Empire”. The communication was part of Panel 5.17 | Part 1, dedicated to ‘New approaches to seaborne commerce in the Roman Empire’ moderated by Th. Schmidts and M. Seifert. The conference was held at the University of Bonn, in the HS VI room from 09: 00-11: 00h. – Mateo González-Vázquez. Title of the communication was “The Iberian rural economy in the face of early Roman expansion (from the 3rd to the 1st centuries BCE)”. 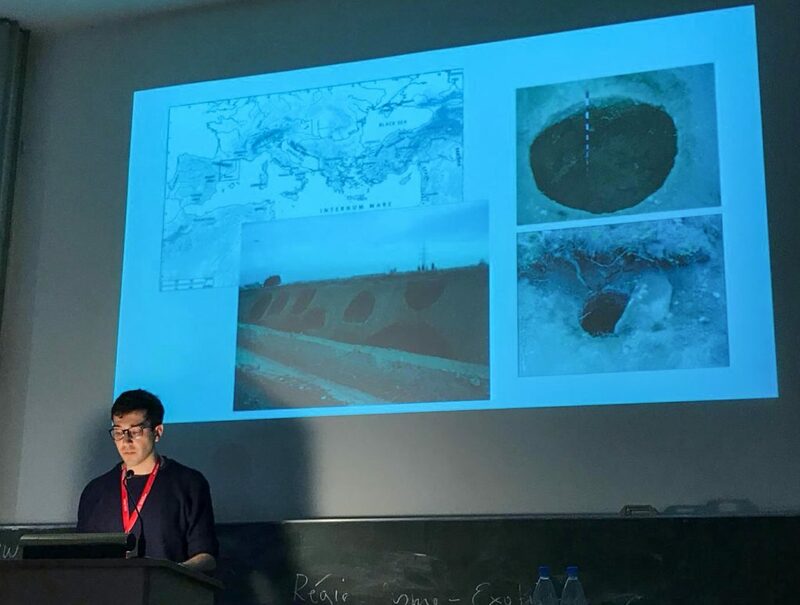 The communication was part of Panel 5.17 | Part 1, dedicated to ‘Targeting economic and cultural hotspots: an alternative view on early Roman expansionism’ moderated by T. Stek. The conference was held at the University of Bonn, in the HS XIV room from 2:30 pm to 4:30 pm.